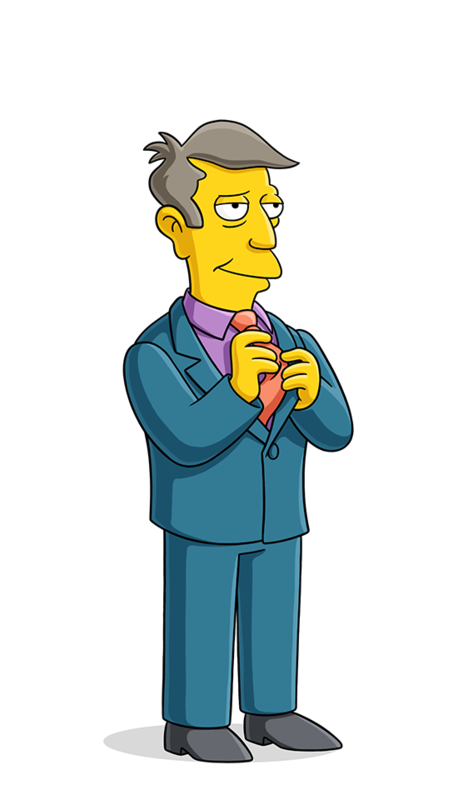 Seymour Skinner. Springfield school leader who lives with his mother and isn't allowed girlfriends. Fearful of Superintendent Charmers. On permanent quest to maintain order which is under constant threat from Bart's paractical jokes. Subsequently, Skinner has been humiliated in most conceivable ways: 100 lbs. tomato exploding on his bottom; wather balloon launched with a picture of his bottom on it; etc. Says: "QUIETTTTT!!!" and "Hmmm, wash basin fresh!" Principal Skinner catches his doppleganger balloon and finds out Bart discovered a comet. Ah got you, my rumpy doppelganger.